Sebald’s popularity among academic critics may have distorted the wider history of novels with images, in that he has become the principal focus of scholarship even though his work is in some respects anomalous. His illustrated novels, poems, and essays are closer to nonfiction, and more experimental with regard to the boundaries of history, memoir, and fiction than some earlier novels with photographs. That investment in raising questions of veracity while exploring historical trauma makes Sebald’s novels markedly different from their surrealist predecessors, despite the fact that surrealist strategies are woven throughout his novels. The history of postwar twentieth-century novels with photographs is far wider than Sebald’s oeuvre, and that wider history is in some danger of being occluded by the assumption that Sebald’s work can stand for the possibilities of postwar novels with included photographs. It seems to me that even the precedents for Sebald’s work are not yet clear. They include surrealism, but surrealist practices may not be his principal source. He himself has spoken of 19th century German forms of narrative as a precedent for his writing, if not his images. The Germanist Sander Gilman, a lifelong friend of Sebald’s (I believe they went to university in Freiburg together, although I haven’t been able to verify that), told me Sebald told him he got the idea of putting images in his novels from Karl Krauss’s Die Fackel . If that is true—and I don’t have a reason to doubt it—it implies an entirely different genealogy than the one that is usually posited, which leads from André Breton and Walter Benjamin forward—with no intermediate steps—to Sebald’s practice beginning in the 1990s. I hope that in the next few decades the historiography of the general subject of writing with images will become clearer; in the meantime, in considering the history of novels with images, it might be prudent not to emphasize Sebald’s practice unduly: we may be reading backwards from his influence on academic critics and experimental writers in the present century, inferring that he should be given an equally important place in the earlier history. In this chapter I will consider three photographs in Rings of Saturn, and then two more general questions: the epistemological veracity of his images in this book, which are often manipulated and difficult to read; and his qualities as a novelist, aside from the question of images. 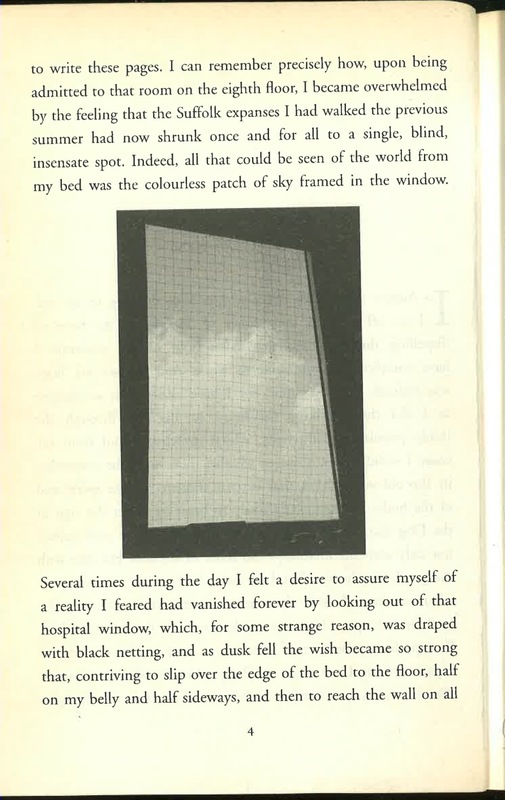 The first illustration is a nearly empty window, with pale clouds and, “for some strange reason,” black netting. It’s an interesting choice, this initial image, and it can be justified as an emblem of the blankness into which the narrator had fallen, and the empty pattern that he would try to fill with his recollections of walks in Suffolk. But in terms of the interaction of narrative and image, it may serve several other functions. From a writer’s point of view it can be helpful to keep initial images simple because that way they do not immediately both anchor and overwhelm the narrative. A complex, forceful image, by its nature, risks attracting too much of the reader’s attention—she may return to it again and again, expecting it to contain all the elements of the text in emblematic or embryonic form, the way that some Baroque frontispieces do. Sebald’s photograph has only a few points of similarity to the text, most notably to Thomas Browne’s quincunx pattern, which is the book’s fifth illustration. This signals not only this image’s special position as an icon or emblem of what will happen in the book, but it also alerts readers to note the relation of all the following images to their accompanying text. 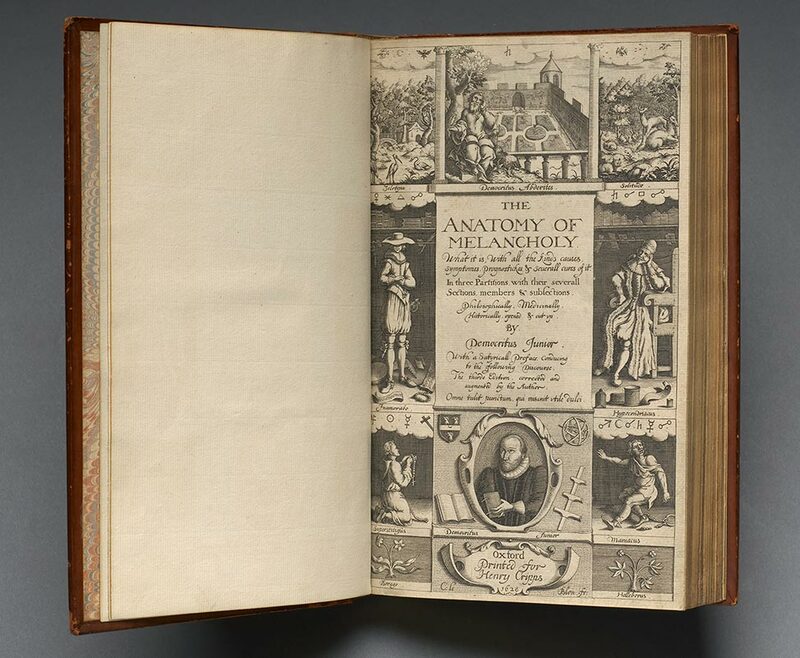 It is a frontispiece to the extent that it suggests rules and themes for reading. This image, the third one in chapter II, was what first interested me about Sebald. It is the reason I wrote to him in 2001 (more on that in the final chapter), and the reason I organized a conference in Ireland in 2005 on the subject of his images. By a circuitous route, it also depicts one of the main subjects in my own writing, which all these notes on “Writing with Images” are intended to explain and, somehow, to help. What’s striking about the quail image is its sudden injection into the narrative, in which it sits like an animal in a cage. (The wire mesh of the cage should resonate for a reader with the unexplained netting over the open window in the book’s first photograph, giving this image a peculiar weight.) The pages leading up to the image of the quail are about the heyday of the country estate that the narrator is visiting. 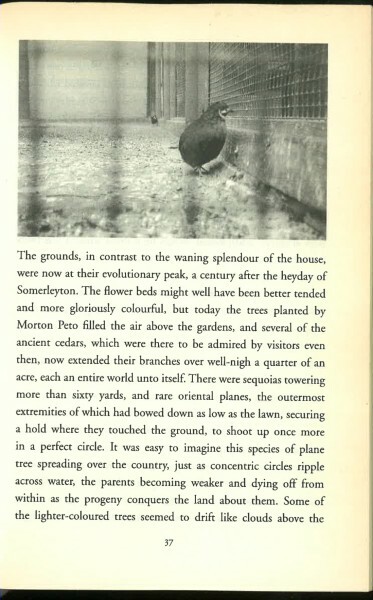 He has been evoking the unparalleled splendor of the estate in the late 19th century, and then he remarks that the place seemed “fine” now that it was “imperceptible nearing the brink of dissolution and silent oblivion.” After he describes the quail, the narrator continues to praise the decrepit, overgrown grounds. However… I was saddened to see, in one of the deserted aviaries, a solitary Chinese quail, evidently in a state of dementia, running to and fro along the edge of the cage and shaking its head every time it was about to turn, as if it could not comprehend how it had got into this hopeless fix. So there is a kind of Chinese box here: the quail is imprisoned in its cage; the representation of the quail is imprisoned in its photograph; the photograph is imprisoned on the page, between two disparate thoughts; and the recognition of “dissolution” is imprisoned between evocations of the past. When I first encountered this image, I thought it was a good model for a tightly constructed imbrication of photograph and text: frames around the image hold it in place, and those frames continue within the image (or, in the inevitable reversed logic, begin from it). 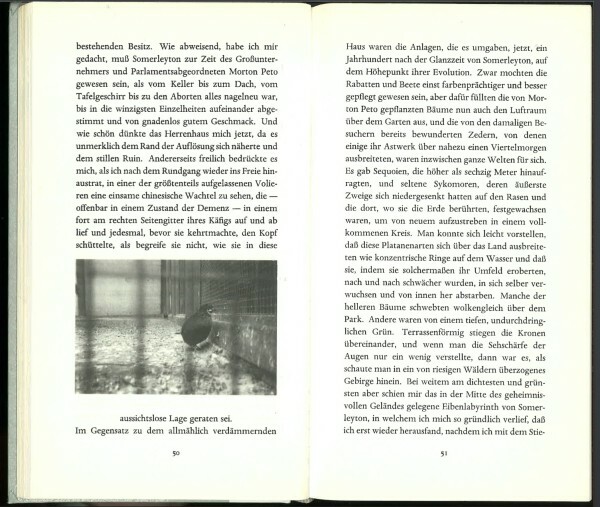 Needless to say this sort of logic binding photograph and narrative cannot be generalized to cases that do not depict cages or nets or coordinate grids (as in an example later in the book) or that aren’t about “oblivion”: but this example shows just how much remains to be done with the interaction of images and text. It is difficult to imagine a tighter relation between narrative and photograph, as if Sebald wanted to bolt the two together—as if he was afraid that otherwise they would fall apart. This incipient or latent fear is, I think, a prevalent theme in his four novels. 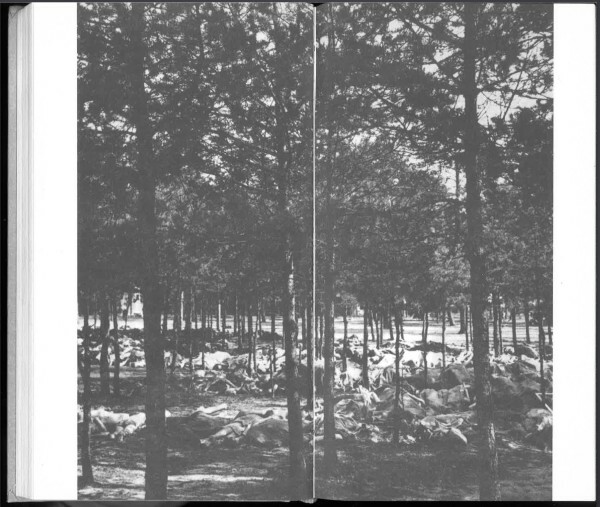 I will have more to say on this in the last chapter, but I think it is also a practical matter, an attempt to persuade the reader to read up to, over, and past the images, without entirely interrupting the flow of reading—with some stark exceptions, as in the photo of Bergen-Belsen I will consider next. 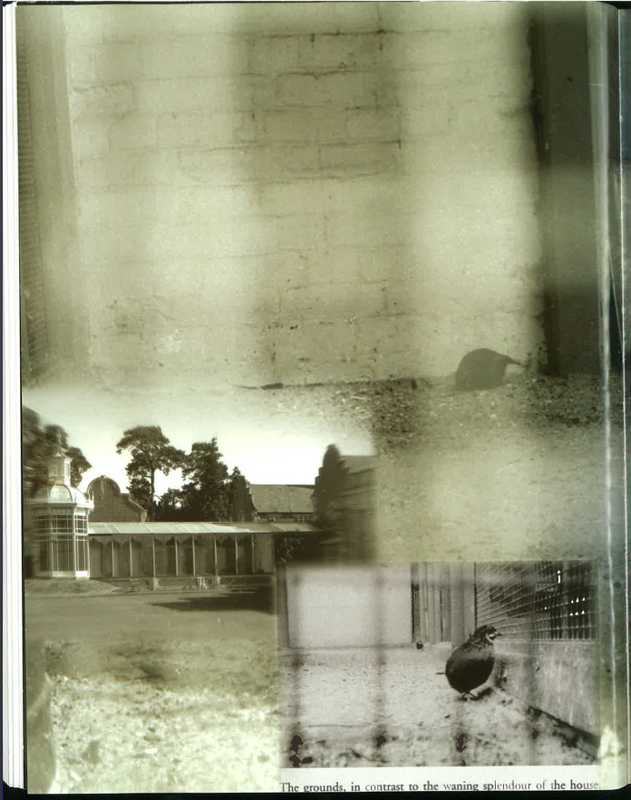 There is a poignant coda to the image of the quail: when Lise Patt and her friends visited Somerleyton in 2004, they were “surprised to find the same lonely quail in his prison cage.” (Searching for Sebald, p. 494.) Their photograph is reproduced as part of a photo-mosaic. The quail is pitiful, head down at the back of its pen, against a cement block wall, veiled by an out-of-focus bar. 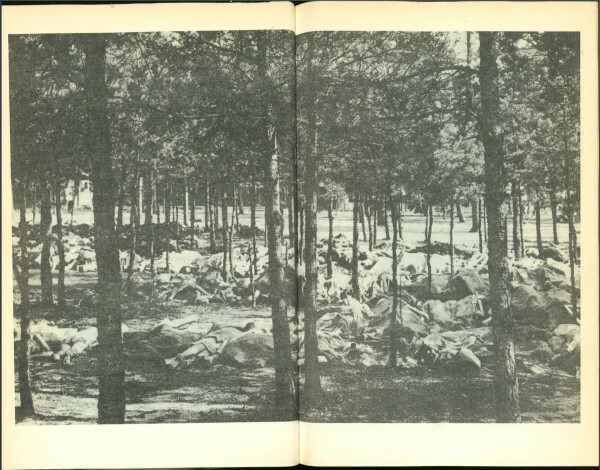 The photograph of corpses at Bergen-Belsen, printed across two pages, is a shock to anyone who first turns the page after Sebald’s brief mention of the liberation of the camp. This is arguably the most disturbing image in the book, and it works more as a break, a fracture in the text, than either an “interruption” or a “distraction” (as these are theorized in chapter 7). “Distraction” is too mild a term, and “interruption” does not capture what happens when a reader sees this image. 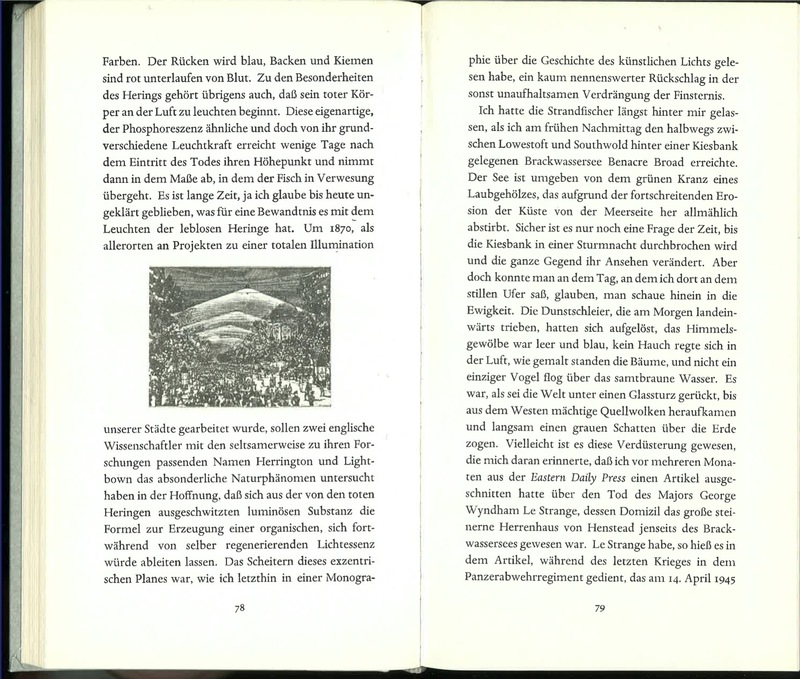 Because Sebald does not immediately return to the theme of the Holocaust, and because this is the first appearance of the Holocaust in Rings of Saturn, the image almost seems to come from a different narrator, one who wishes to break in to the current narrator’s monologue in order to underscore what he is missing. 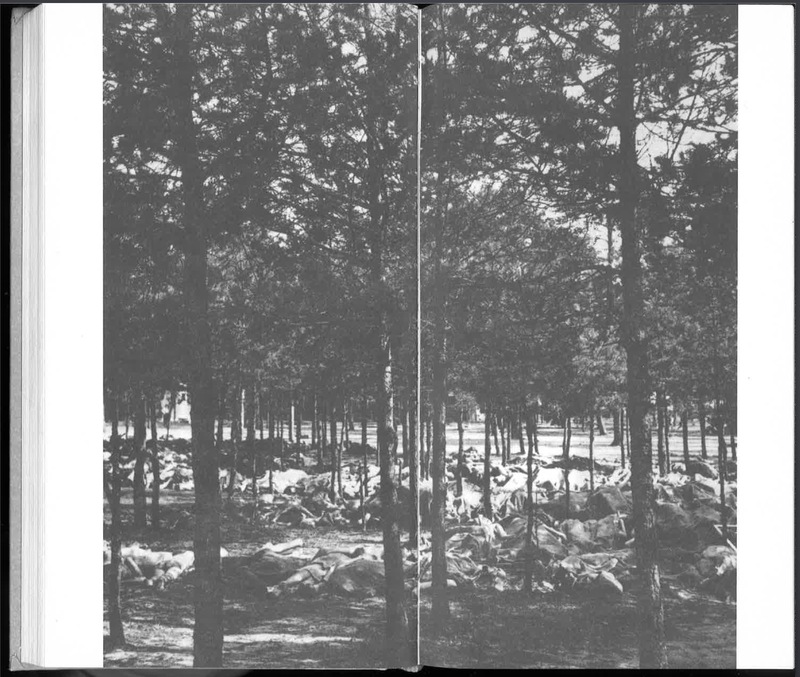 As other readers have noticed, there is a weird resonance between the dead bodies in the forest glade and the evocations of “billions” of herring on the pages preceding the photograph. Sebald has just described how herring look in life and in death, how they suffocate, how they were tortured for scientific purposes, how they have been poisoned by modern industry and agriculture, and how they looked in the sea when they swam in vast shoals. There is also a visual parallel between this image and a photo just 7 pages before it showing thousands of herring on a factory floor. Those parallels and others will occur to a reader as she reads the two or three pages after the image has appeared, creating—for me at least—a double consciousness. One part of me follows the narrator as he continues with funny stories of an eccentric aristocrat (the one who, when he was young, had helped liberate Bergen-Belsen); another part of me keeps thinking of the image, collecting parallels and echoes from the preceding pages on the herring industry. It’s as if part of me wants to make sense of the image by drawing on whatever material I can recall from the past few pages, bolstered by the thought that Sebald must have intended most, if not all, of the parallels I find—while another part of me recognizes that Sebald intended the image to be an anomaly, what philologists call a hapax, a unique occurrence in a text. In that second reading, the point of the image’s singularity, and the absence of any direct description of it in the text, is to underscore the impossibility of understanding it by comparing it with anything. 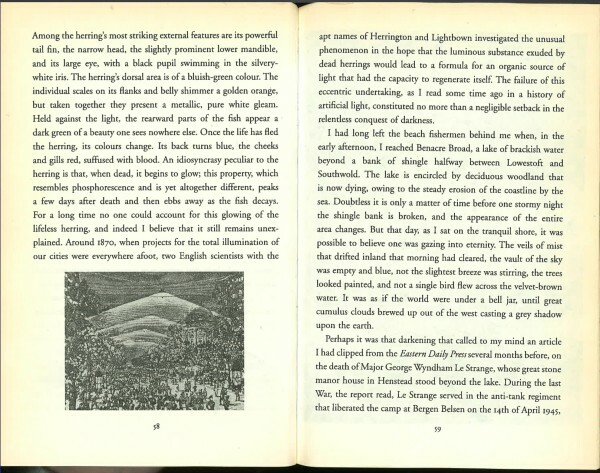 It is difficult to decide if the main significance of the image is its unassimilable shock, compounded by the retrospective realization that it cannot be interpreted, or whether the awareness of the narrator’s insistence that it cannot be interpreted is itself the shock, which reverberates throughout the book, as the reader returns to images that are perfectly well interpreted by their contexts. 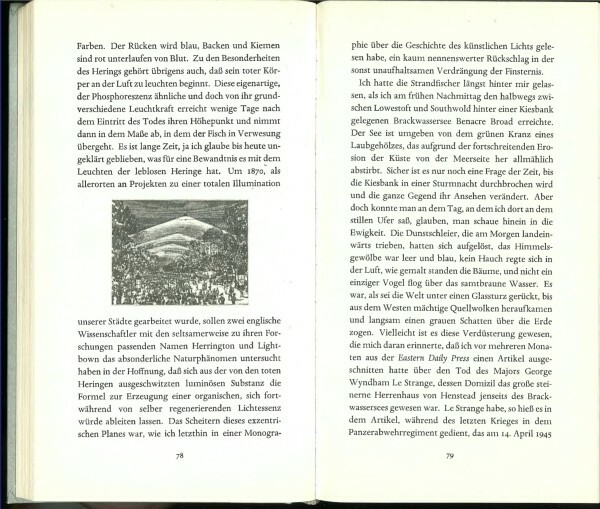 Several commentators have noted that certain photographs in Rings of Saturn are barely legible, for example the illustration of an experiment in lighting (that is the image that comes just before the Bergen-Belsen image), or the photo, above, that shows the Chinese Empress Tz’u-hsi (Cixi in Pinyin; it is odd that Sebald uses the old Wade-Giles transliteration). That large assertion aside, there is a double claim in the secondary literature: on the one hand, the more nearly illegible photographs make us question their veracity (“we are forced to renegotiate our contract with the photograph’s… agreed-upon ability to represent the world”); and on the other, that questioning both requires us to read them as manipulated objects (and attend to “the disorienting ‘affect of the Real'”), and also is made possible by our awareness that they are manipulated objects. This double claim sets in motion a particular kind of reading. We are aware of the manipulation and choice of photographs, and therefore we think about the photographs’ inadequacy; we see the inadequacy, and so we notice more of Sebald’s manipulations and choices. We also begin to read differently: instead of reading through the book, as the narrative asks us to do, we tend to examine the book, reading back and forth. Because the images of beaches, bridges, marshes, and rivers are often “maddeningly similar” and nearly free of content, a reader may thumb back and forth, looking at their placement on the page, “the degree or type of bleed,” or some other clue about their ordering: in other words, a reader may look at the images both for their traces of veracity (the first point) and their degree of manipulation, self-similarity, ordering, and formatting (the second point). The Rings of Saturn includes some of Sebald’s most concerted experiments in undermining the veridical, evidentiary function of photographs and drawing attention to their damaged, degraded, manipulated state. 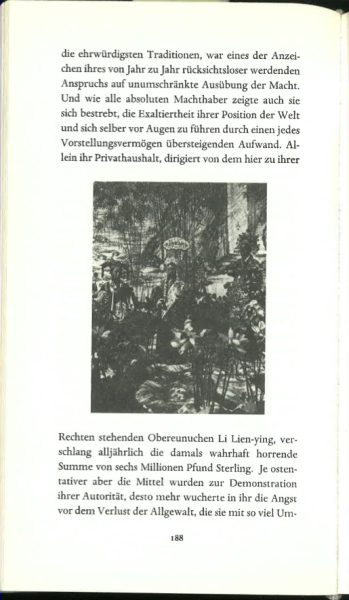 As such it has been very influential: many books, from Tan Lin’s Seven Controlled Vocabularies to Jesse Ball’s Silence Once Begun, pursue the strategies Sebald initiated in Rings of Saturn. Photographs with minimal, indifferent, or illegible content are reproduced badly, in low contrast, without detail, or with signs of age. It is an aesthetic of the careless, the inexpert, and the everyday, but also the hopeless, the disillusioned, the pessimistic. It is as if the world cannot be well represented by photographs, so photographs have to be curated to retain what veracity they have and also, illogically, manipulated and even antiqued in order to demonstrate their inadequacy. The practice therefore involves a false nostalgia, because photographs have to be printed in a certain way in order to express a property that is implied to be inherent in photography in general. The world Sebald actually photographed in Suffolk and Norfolk wouldn’t have been that grey and listless: it had to be made that way in order to underwrite the themes of loss, oblivion, destruction, and historical amnesia. Without those historically grounded themes the practice of indifferent photography, indifferently reproduced, can become a kind of anemic aesthetization, as it does for example in Tan Lin. When the manipulation of the photographs becomes too apparent, for example in the Xeroxed image of the bridge that we are told was for a Chinese railway, the effect is also precious. That does not happen often in Sebald, but it opens the way to the fetishization of the book itself, and the entire theme of artists’ books. I mention these points to underscore how precarious Sebald’s practice in this book is: he means to explore the unreliability of photographs, and their relation to what cannot be seen, remembered, experienced, or represented, and to do so he manipulates them and reproduces them in such a way that they avoid what he called “high photographic quality.” (Interview, in Searching for Sebald, p. 106.) But that very manipulation is an aesthetization, and it is distracting, making us think more about the author than the narrator, prompting us to “fetishize” the photographs (Searching for Sebald, 508-9), creating the impression that historical loss is adequately represented by repeatedly Xeroxing a photograph, reducing trauma to a kind of impoverished photographic aesthetics. Authors including Tan Lin and Jesse Ball have found this practice seductive, but it is also precious, anemic, fetishistic, and, in the end, even cowardly, because it does not let the photographs, and the world behind them, speak as fully as they could. Sebald’s best photographs in Rings of Saturn, I think, are the anomalous ones, like the first three I have discussed. The weaker practice is the illegible photographs, the Xeroxed photographs, the indifferent seacoasts and rivers, the interchangeable nearly empty landscapes. 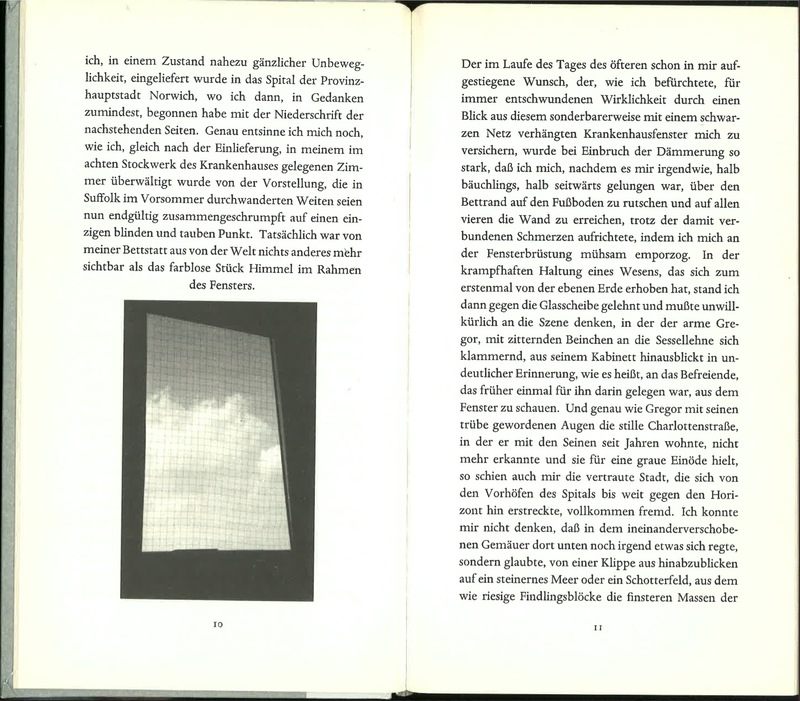 They could be made into anomalies if Sebald had wanted to pay attention to them individually, but his interest was in having them work integrally with a continuous flow of narration. Although it is not my subject here, I want to register that I am not often convinced by Sebald’s narratives aside from their photographs. His novels have been catnip to academics because of their familiar range of references. Rings of Saturn makes six scholarly references in its opening 10 pages: Kafka’s “Metamorphosis,” Charles Ramuz, Flaubert’s sense of language, Dürer’s Melencolia, the 1911 edition of Encyclopedia Britannica, and Thomas Browne’s Urn Burial. (Sebald’s remarks on Browne have recently been reprinted in an edition of the Urn Burial; the publisher calls Sebald’s comments “magisterial.”). Readers who have read Urn Burial will understand the opening and closing of Rings of Saturn better than those who haven’t; readers who know the significance of the 1911 edition of the Encyclopedia Britannica will understand why Sebald mentions it, and so forth. Of these six references, I don’t know Ramuz, and I’m aware I’m missing something in Sebald’s description of his friend the Ramuz scholar. Sebald’s references point with great precision to a certain limited class of readers: academics and university-educated people, mainly in Europe, principally of Sebald’s generation or the three or four before him. This isn’t an argument for a certain kind of more populist novel, or against cultural allusions. Nor am I arguing that Sebald is condescending, elitist, or exclusive: on the contrary, I think his range of references comes naturally to him, and it is presented as openly and affectively as it could be. What bothers me is that some of his commentators do not take that into account: the implication sometimes is that the narrow social and economic range of Sebald’s readers is invisible or uninflected, so that the writing is simply literature. I think of scholars like Mariano Siskind in this regard: it is necessary to remain attentive to the narrow social and historical readership implied in Sebald’s work. The novels are also full of an easy melancholy, a kind I recognize as an historian’s malady. Sebald’s prose is sympathetic, mellifluous, continuous, and sometimes hypnotic, but it has a limited expressive and tonal range: its typical mode is indulgently sad, circuitously reticent, limitlessly retrospective. The affective and stylistic range is narrow. (There are counterexamples: there is a great emotional range, for example, in Sebald’s comments on Walser.) If Sebald’s books had been published without illustrations, I wonder if they would be as widely read: in comparison to other novelists born in the 1940s, such as Martin Amis or Ian McEwan, Sebald’s emotional and tonal range is muted. His narrators love to be immersed in the continuous loss of historical memory, of places and people who have disappeared. Often I suspect the melancholy tone coddles the author’s unhappiness rather than challenging it. Each new mention of someone’s death, a building that has been destroyed, a library burnt, a location lost (all those from the first five pages of Rings of Saturn) deepens the melancholy and sweetens it. But none of that is my subject here, just as my antipathy to Breton’s treatment of Nadja wasn’t the issue in relation to that book: I only wanted to note these reactions for the sake of honesty. Melancholy is widely acknowledged as a fundamental potential of the human or at least the artistic condition (Burton, Eliot, Matthew Arnold, even Shakespeare, Rilke, Tolstoy, Chekhov, or in art – Dürer, Friedrich, or in music Mahler, Schönberg, …). You seem to have a problem with this fundamental quality of the artistic imagination. Maybe you should read Touched by Fire (Kay Redfield Jamison). Nostalgia is not its heart. You are wrong there in my view. It is the quality of transience, and in Sebald tragically combined with the indifference of history to human suffering. And above it all is the impossibility of ever repeating a single moment. Thanks for that. Actually I am very interested in melancholy and not at all allergic to its darker moments (as in Burton’s passages on melancholy that attacks melancholy). It’s the sweetness, the ease of Sebald’s melancholy that I sometimes get tired of. As a German Sebald scholar, I often find the degree of sloppiness in US research problematic. Like this piece, essays and articles are often riddled with assumptions stemming from limited background knowledge about German-speaking culture. This piece repeatedly makes claims that would add to Sebald scholarship if the author had also presented proof to support his segments and assumptions. 1. Gilman: I don’t find any mention of him having studied in Freiburg in his official CV and even if him and Sebald had been friends, it is odd that there isn’t a single piece of correspondence between them kept in the Sebald papers at Marbach, as the online catalogue indicates. 2. 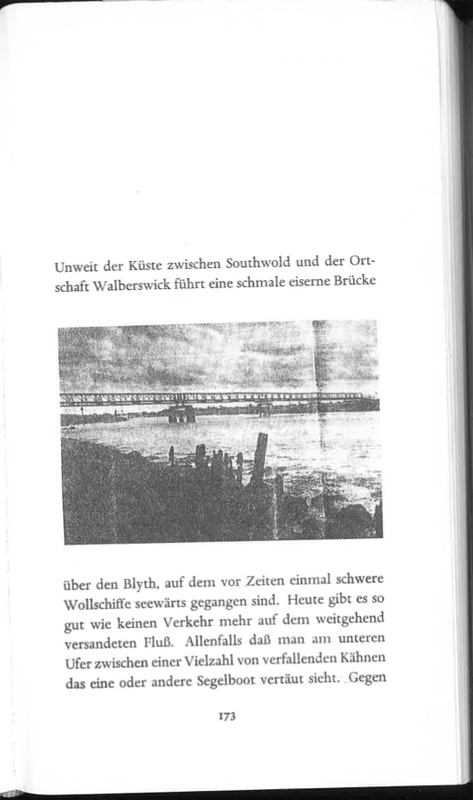 There are some scholars claiming Sebald’s use of images was influenced by Breton/surrealism, but the general consensus in German-speaking criticism is that the relevant names are Brinkmann and particularly Kluge, as well as Theweleit (as Sebald told me himself). 3. 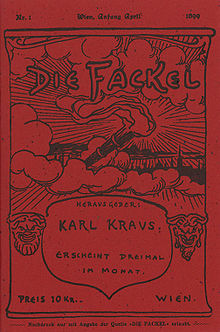 Kraus is not spelled Krauss, and editions of “Die Fackel” aren’t listed in the bibliography of Sebald’s personal library or are they to be found amongst his books kept in Marbach. Though he was familiar with the journal as a scholar of Austrian literature that strongly invalidates Gilman’s claim you uncritically replicate. But in any case it is nonsense as there were hardly any illustrations in the Fackel anyway. Thanks for the information on Brinkmann and Kluge. Any thoughts on the project’s larger themes?